Pamela Murphy, widow of WWII hero and actor, Audie Murphy, died peacefully at her home on April 8, 2010. 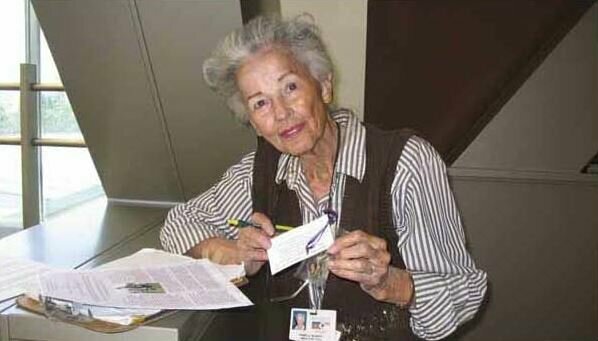 She was the widow of the most decorated WWII hero and actor, Audie Murphy, and established her own distinctive 35 year career working as a patient liaison at the Sepulveda Veterans Administration hospital, treating every veteran who visited the facility as if they were a VIP. Any soldier or Marine who came into the hospital got the same special treatment from her. She would walk the hallways with her clipboard in hand making sure her boys got to see the specialist they needed. If they didn't, watch out. Her boys weren't Medal of Honor recipients or movie stars like Audie, but that didn't matter to Pam. They had served their country. That was good enough for her. She never called a veteran by his first name. It was always "Mister." Respect came with the job. "Nobody could cut through VA red tape faster than Mrs. Murphy," said veteran Stephen Sherman, speaking for thousands of veterans she befriended over the years. "Many times I watched her march a veteran who had been waiting more than an hour right into the doctor's office. She was even reprimanded a few times, but it didn't matter to Mrs. Murphy. "Only her boys mattered. She was our angel." Audie Murphy died broke in a plane crash in 1971, squandering millions of dollars on gambling, bad investments, and yes, other women. "Even with the adultery and desertion at the end, he always remained my hero," Pam told me. She went from a comfortable ranch-style home in Van Nuys where she raised two sons to a small apartment - taking a clerk's job at the nearby VA to support herself and start paying off her faded movie star husband's debts. At first, no one knew who she was. Soon, though, word spread through the VA that the nice woman with the clipboard was Audie Murphy's widow. It was like saying General Patton had just walked in the front door. Men with tears in their eyes walked up to her and gave her a hug. "Thank you," they said, over and over. The first couple of years, I think the hugs were more for Audie's memory as a war hero. The last 30 years, they were for Pam. One year I asked her to be the focus of a Veteran's Day column for all the work she had done. Pam just shook her head no. "Honor them, not me," she said, pointing to a group of veterans down the hallway. "They're the ones who deserve it." The vets disagreed. Mrs. Murphy deserved the accolades, they said. Incredibly, in 2002, Pam's job was going to be eliminated in budget cuts. She was considered "excess staff." "I don't think helping cut down on veterans' complaints and showing them the respect they deserve, should be considered excess staff," she told me. Neither did the veterans. They went ballistic, holding a rally for her outside the VA gates. Pretty soon, word came down from the top of the VA. Pam Murphy was no longer considered "excess staff." She remained working full time at the VA until 2007 when she was 87. "The last time she was here was a couple of years ago for the conference we had for homeless veterans," said Becky James, coordinator of the VA's Veterans History Project. Pam wanted to see if there was anything she could do to help some more of her boys. Pam Murphy was 90 when she died last week. What a lady.